HELLO I HAVE A GERMAN SHEPHERD THAT HAS JUST RECENTLY TURNED ONE. FOR THE PAST COUPLE OF DAYS HE IS REALLY STIFF AND CAN'T MOVE VERY WELL, HE YELPS WHEN HE STANDS UP TOO. SOME DAYS HE IS OFF HIS FOOD BUT I HAVE STARTED FEEDING HIM CHICKEN AND RICE WHICH HE EATS VERY QUICKLY. This sounds like what happened to our 2 yr old rescue... she was diagnosed with Lyme disease and required a month long course of antibiotics. Her front shoulders were alternatingly warm and tender and she cried every time she tried getting up; had to mix her kibble with canned food and sit with her to eat. DO NOT WAIT FOR THE INTERNET FOR ANSWERS THAT ONLY A VET CAN TELL YOU FOR SURE... CALL THE VET NOW IF NOT YESTERDAY. DO THIS FOR YOUR FRIEND ASAP!!!! Don't wait for guesses CALL your VET NOW. 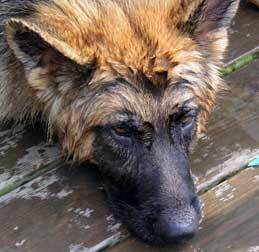 If a 1 year old German Shepherd is acting lethargic and in noticeable pain for days it is not normal. If he has something like an intestinal blockage due to twisting the clock is ticking. Only a vet can diagnose something like this with an X-ray.